The 10,000 metres or the 10,000-metre run is a common long-distance track running event. The event is part of the athletics programme at the Olympic Games and the World Championships in Athletics and is common at championship level events. The race consists of 25 laps around an Olympic-sized track. It is less commonly held at track and field meetings, due to its duration. The 10,000-metre track race is usually distinguished from its road running counterpart, the 10K run, by its reference to the distance in metres rather than kilometres. 10,000 metres at Sydney 2000. The 10,000 metres is the longest standard track event. The international distance is equal to approximately 6.2137 miles (or approximately 32,808.4 feet). Most of those running such races also compete in road races and cross country events. 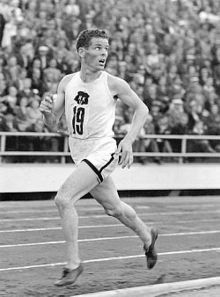 Taisto Mäki from Finland breaks the 30-minute barrier in Helsinki on 17 September 1939. Added to the Olympic programme in 1912, athletes from Finland, nicknamed the "Flying Finns", dominated the event until the late 1940s. In the 1960s, African runners began to come to the fore. In 1988, the women's competition debuted in the Olympic Games. Official records are kept for outdoor 10,000-metre track events. The world record for men is held by Kenenisa Bekele of Ethiopia in 26:17.53, posted at Brussels, Belgium on August 26, 2005. For women, the world track 10,000-metre record is held by Almaz Ayana of Ethiopia in 29:17.45 to win gold at the 2016 Rio Olympics on August 12, 2016. The 10,000 metres demands exceptional levels of aerobic endurance, and elite athletes typically train in excess of 160 km (100 miles) a week. 10,000 metres is the slightly longer metric derivative of the 6-mile run, an event common in countries when they were using the imperial measurement system. 6 miles was used in the Commonwealth Games until 1966 and was a championship in the United States in non-Olympic years from 1953 to 1973. It is 24 laps around a quarter mile (440 yard) 1320 ft 0 in (402.33 m) track. Kenenisa Bekele (right), the current 10,000 m world record holder. Correct as of August 2017. Kenenisa Bekele also ran 26:20.31 (2004), 26:25.97 (2008), 26:28.72 (2005), 26:43.16 (2011), 26:46.19 (2007), 26:46.31 (2009). Haile Gebrselassie also ran 26:29.22 (2003), 26:31.32 (1997), 26:41.58 (2004), 26:43.53 (1995). Boniface Toroitich Kiprop also ran 26:41.95 (2006). Leonard Komon of Kenya ran the 10k road distance in a time of 26:44 in a world record performance in Utrecht on 26 September 2011. While run over the same distance, the time was set on a road course and is therefore not eligible to be considered among the top performances listed here. Tirunesh Dibaba also ran 29:54.66 (2008), 30:15.67 (2005). Almaz Ayana also ran 30:07.00 (2016), 30:16.32 (2017). Meseret Defar also ran 30:08.06 (2013). Paula Radcliffe also ran 30:17.15 (2004). Elvan Abeylegesse of Turkey's time of 29:56.34 set in Beijing on 15 August 2008 was annulled due to doping offense. Joyciline Jepkosgei of Kenya ran the 10k distance in a time of 30:04 en route to her world record performance in the half-marathon in Prague on 1 April 2017. While run over the same distance, the time was set on a road course and is therefore ineligible to be considered among the top performances listed here. Violah Jepchumba of Kenya ran the 10k distance in a time of 30:05 en route to her personal best in the half-marathon in Prague on 1 April 2017. While run over the same distance, the time was set on a road course and is therefore ineligible to be considered among the top performances listed here. ^ "Olympics Men's 10 KM Winners - List of Gold, Silver & Bronze Medalists at Olympic Games". olympics.india-server.com. ^ a b "10,000 Metres - men - senior - outdoor | iaaf.org". IAAF. Retrieved 2015-11-13. ^ "10000m Results" (PDF). IAAF. 4 August 2017. Retrieved 4 August 2017. ^ "10,000 Metres - women - senior - outdoor". IAAF. 5 August 2017. Retrieved 5 August 2017. ^ a b c d e f "Women's 10000m Results" (PDF). Rio 2016 official website. 11 August 2016. Retrieved 12 August 2016. 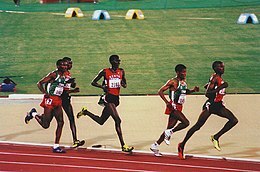 Wikimedia Commons has media related to Long-distance running.